Everyone loves a good pirate game. Port Royal, Rum and Bones, Libertalia, Black Fleet, and Jamaica to name a few. There’s something romantic about pirates: the freedom of the open ocean, setting your own hours, and lots of treasure. 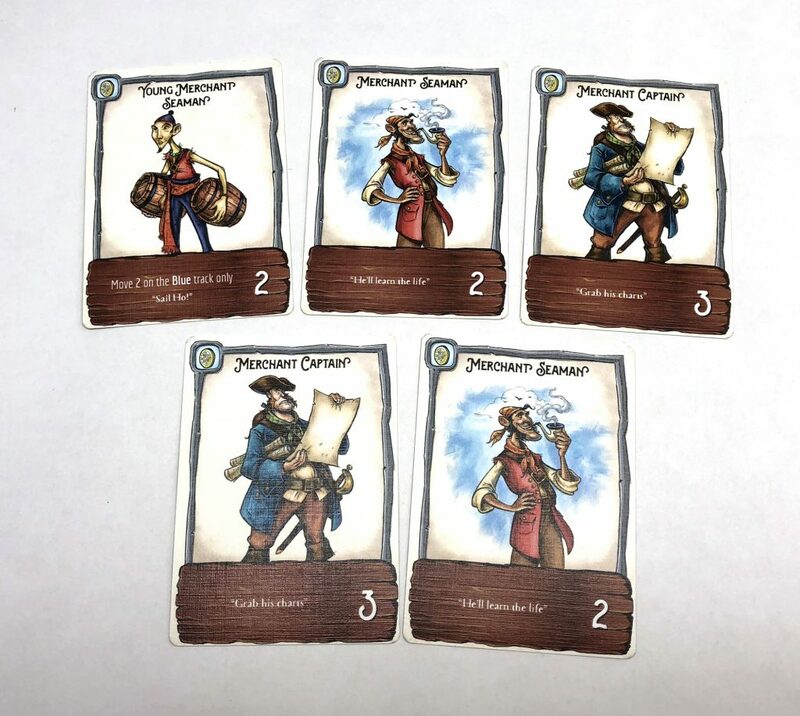 In Extraordinary Adventures: Pirates, from the same publisher who brought you Raccoon Tycoon, players race across the board trying to be the foremost scallywag in all the Caribbean. Along the way you’ll ransack merchant ships for their treasure, sail into ports and pick up new crew members, and try to stay just one step ahead of the competition. The first player to reach Trinidad may just win the title of “Scourge of the Salt Water”. 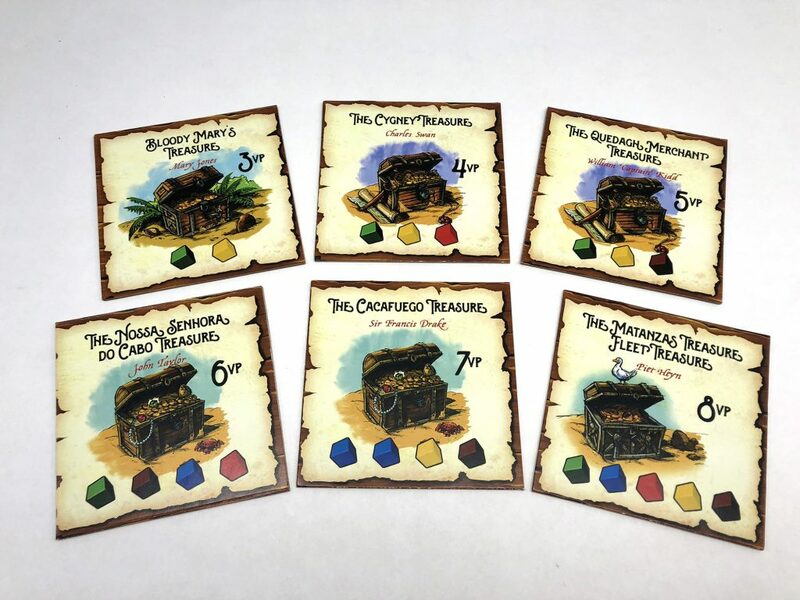 Extraordinary Adventures: Pirates is a deck building board game along the same lines as Clank, and Quest for El Dorado. 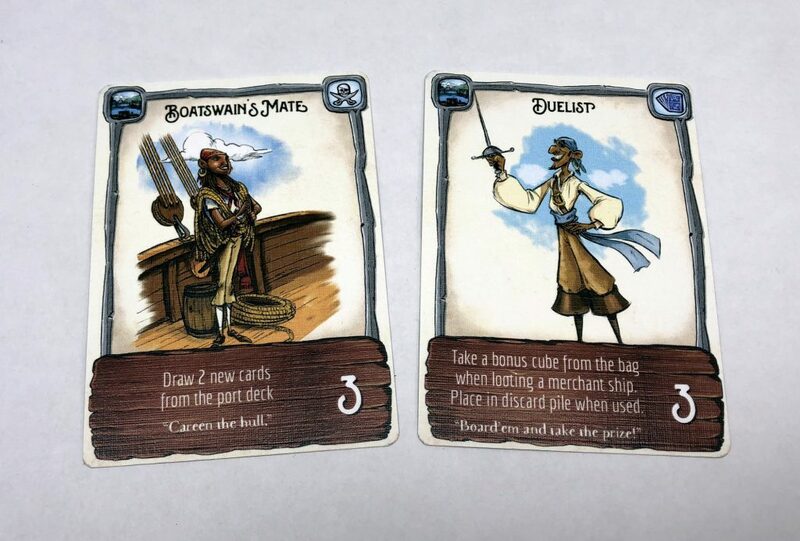 Players each start with the same deck of low powered cards, and will attempt to improve their deck by picking up cards from port spaces, and merchant ship spaces. Three of the 10 cards in the starting deck for the yellow player. 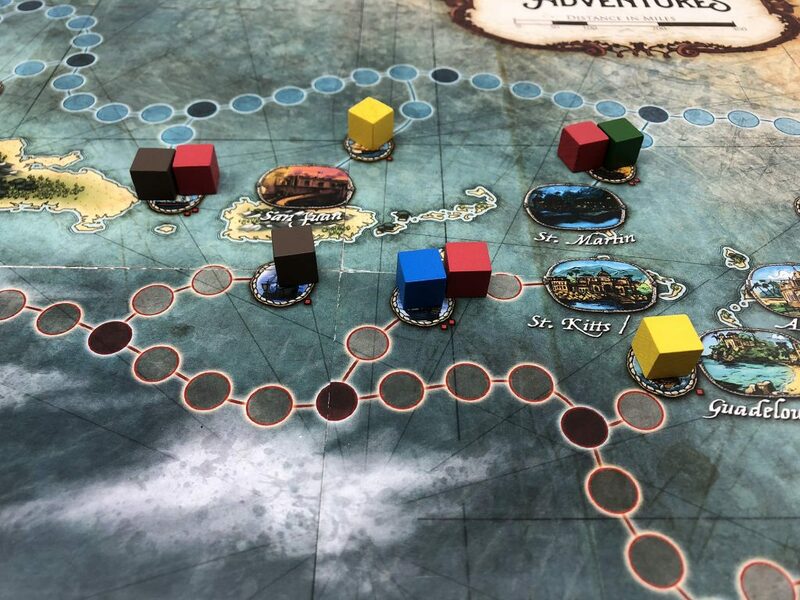 Each turn players will play 3 cards from their hand of 5, advancing one or all of their three ships along three separate tracks (black, red, and blue). In addition to a simple numeric value representing straight movement points, many cards will offer alternate actions at the bottom. Some cards offer additional movement points on other tracks, while some cards allow you to move an increased number of points on a certain track. Still other cards allow you to streamline your deck, or even decrease the amount of goods you’ll need to pay for treasure cards which provide valuable end game points. 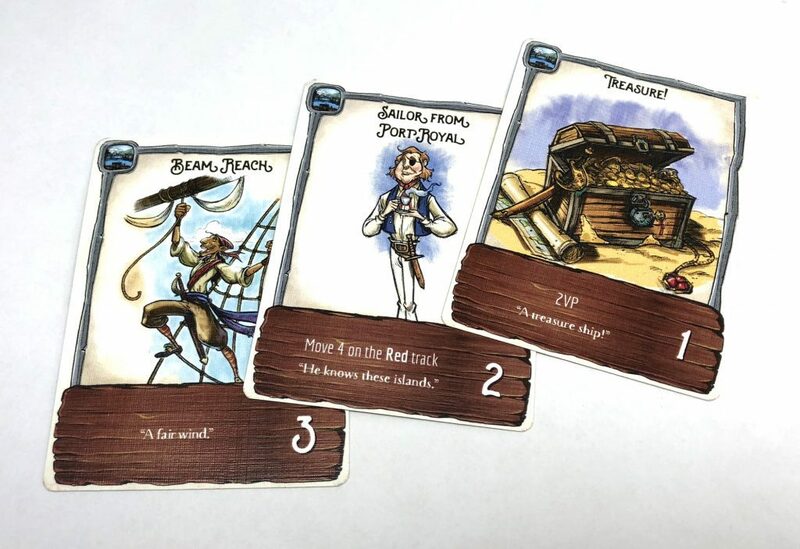 In addition to the starting deck, cards in Pirates are broken into 3 decks: starting decks (all the same), the Merchant deck (given to players who rob merchant ships), and the Port Deck (given to any player arriving in port. Cards are additionally broken into three different types: standard (play once, then place in your discard pile), play to table (provides a permanent modifier), and remove from game (play once then return to box). Deciding when to use a card for it’s numeric movement value, and when to use it’s alternate action is key to winning the game. The card on the left can be played once, then discarded. The card on the right is played to the table can be used on demand. 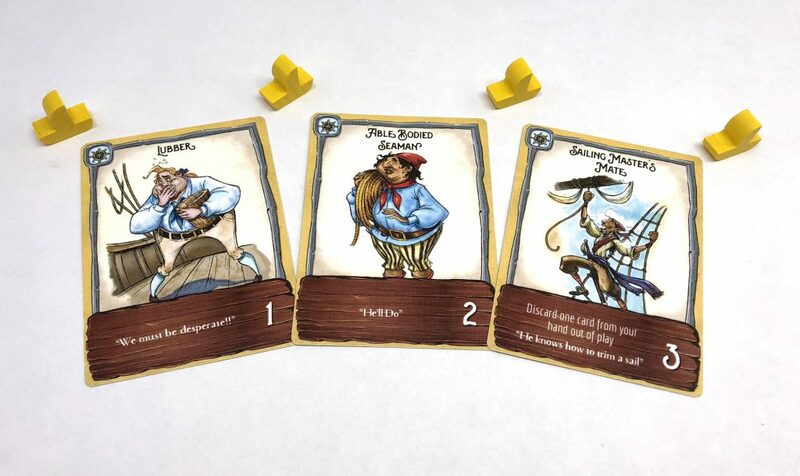 Movement in Pirates is as simple as playing a card, and deciding what numeric value you’ll be using. Many of your starting cards only allow movements of 1 space at time, so you’ll want to get rid of those cards rapidly. Pirates offers 3 tracks to players; forcing them to focus on 1 or two, or potentially do poorly at all 3. Staying ahead of your competition is important thanks to the tantalizing merchant ships just ripe for the picking. It’s also important to remember that at the end of the game, each track will pay out points for 1st through 4th places (depending on player count). Focus too much on robbing fat merchant ships and you might lose out on sweet victory points. The black, red, and blue tracks on the board. Stealing from merchant ships is simple…just sail on to their space and grab all their goods (represented by cubes of 5 different colors). Raiding merchant ships doesn’t earn you points directly, but it’s the only way you can get goods; so think before you pass by merchant ships. Each space containing cubes is a merchant ship. Players also get useful merchant cards drawn from the top of the merchant deck. Port spaces are sprinkled along all three tracks, each space representing an actual city. Sail into port and you’ll have your pick of potential crew members from the port deck. You’ll always have a choice of three, unless you’ve got a card which gives you additional options. As previously mentioned, Pirates is a race to the finish. 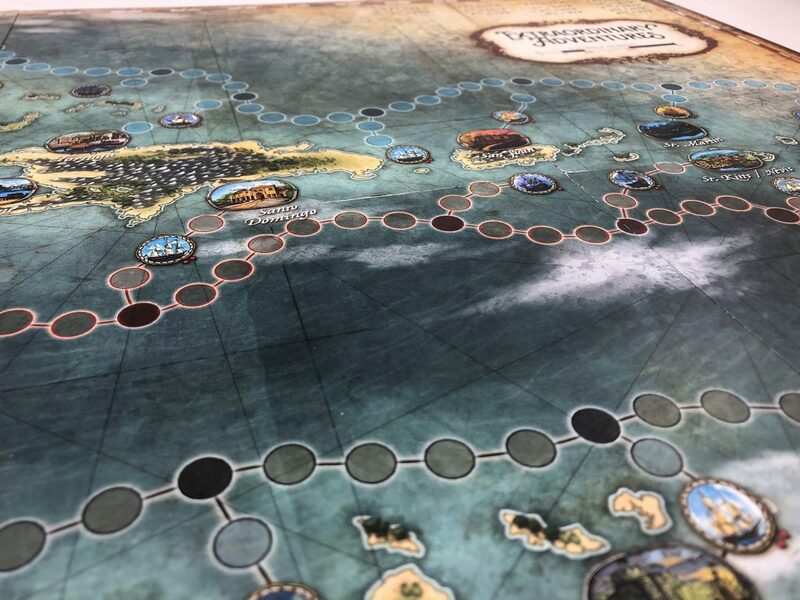 The first player to reach Trinidad immediately ends the game. Players earn points from a number of sources: treasure tiles, certain cards, remaining resource cubes, and their position on each track. For example in a 5 player game the first player on each of the three tracks earns 16 points, while the 5th player earns nothing. The player with the most point wins the game. I really enjoyed Raccoon Tycoon, the previous title from Forbidden Games. It’s a fun and easy to understand introduction into stock market games. Pirates reminds me of that game (it is by the same designer after all). It’s quite simple to play…pick three cards from a hand of 5, then do what those cards tell you to. The challenging part is watching your opponents, seeing where they’re moving, and deciding whether you want to challenge them for dominance in that area. In the last game I played two of the five players didn’t even more their ships on the red track until 2 turns from the end of the game. Having three tracks forces you to make tough decisions. It’s impossible to do well on all three, and sometimes it’s hard to succeed on TWO tracks. So making the best use of your cards is paramount. Choosing when to use the special action vs simple movement is also important, as is picking the right cards when they’re presented to you. Pirates is straightforward at first, but with a tricky subtext. Pirates also features gorgeous art from the team of Jared Blando, Jacoby O’Connor, Mark Page. The character illustration is fun and engaging. Cartoony but not campy. The board itself is lush, and interesting to look at. The rulebook, while not final, is filled with pirate trivia and interesting to read in addition to being useful. All good things aside, Pirates also has some potential issues. It can sometimes feel like the spaces are too far apart…it might take you 2 turns or more (depending on card draw) to move from one “good space” to another. And since you have 3 tracks to be concerned with, that can make the beginning of the game feel like a bit of a slog. Perhaps some simple tweaking of spacing and pacing might smooth the gameplay out. Another issue was that with only three tracks, if one player was able to leap out ahead on any track, it was tough to get past them and make it to a merchant ship to collect cubes. In my last game, I had no treasure tiles at the end of the game; that said I was able to advance quite far on 2 tracks which earned me a good amount of points. In our first five player game, we felt like three tracks were too few, and the tracks too long. We discussed what a 5 player specific board might look like, with 4 shorter tracks providing more options and potential for advancement, or possibly being able to play all 5 cards from your hand. As this was a prototype, there were also some occasional issues with misprints (hopefully). One card had a numeric value of 2, with special action text indicating that the player could advance 2 spaces on the red track only…why bother? 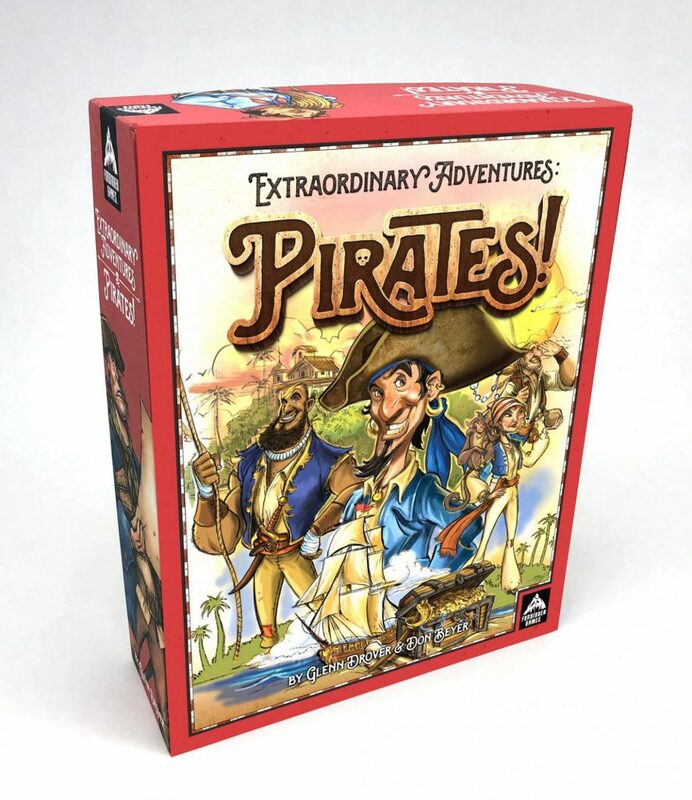 Even with some of the previously mentioned issues, Extraordinary Adventures: Pirates is a great intro to the light to medium weight slice of gaming. Experienced gamers will appreciate the choices, while novice gamers will enjoy the simple movement and point collection. Pirates has something for everyone, without trying to be all things to all people. It’s currently live on Kickstarter, so head over to their campaign page and check it out for yourself!